The sunny days with very little wind I will admit have been tougher for me. Bait on the west side of the lake is the real challenge. From Highport Marina and to the west is pretty muddy water due to the rain and snow. I have mainly fished the stained water from Mill Creek back to the north working the 45-60 foot water. Whether fishing on anchor or drifting I'm using live bait mixed in with a some dead sticking. Using super flukes on 3/4 oz jig heads in colors of white ice and pearl with the tail dipped in chartreuse spike it. 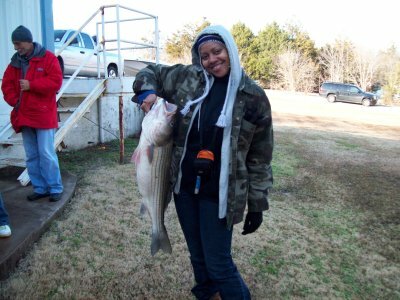 On the other days, I find the stripers like the chartreuse/glitter a little better. I fish it like live bait. I measure it down as if it were live bait and put it in the rod holder and wait. 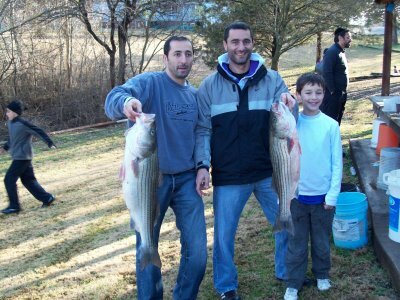 p>A lot of the stripers being caught are 20"+. Make sure you take the time to measure your fish om the correct manner. 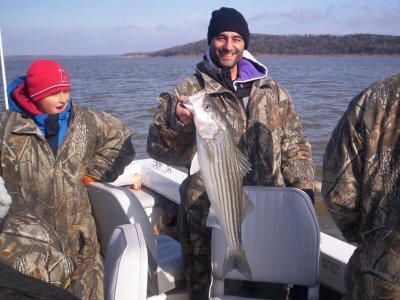 Our Lake Texoma limit is 10 stripers and only 2 of the 10 can be 20" or better. With spring break around the corner we expect to see a lot more boating traffic so be safe and courteous and enjoy your day on beautiful Lake Texoma.